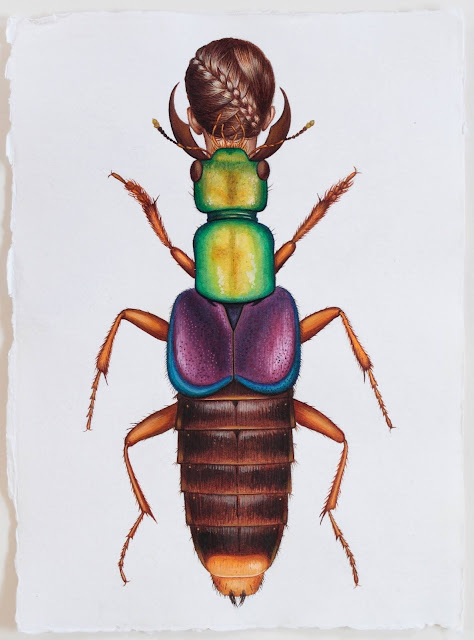 watercolour on Khadi rag paper, 41.91 x 29.72 cm. (Photo credit: Tim Gresham). 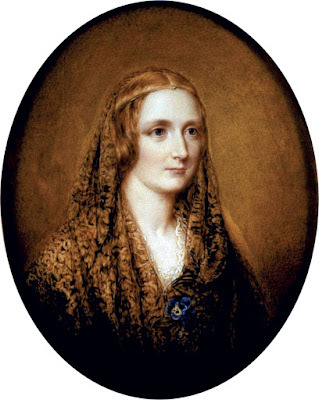 In the two hundred years since Mary Shelley documented the creation of Frankenstein’s monster and its aftermath, our fascination with the hybrid has never wavered. 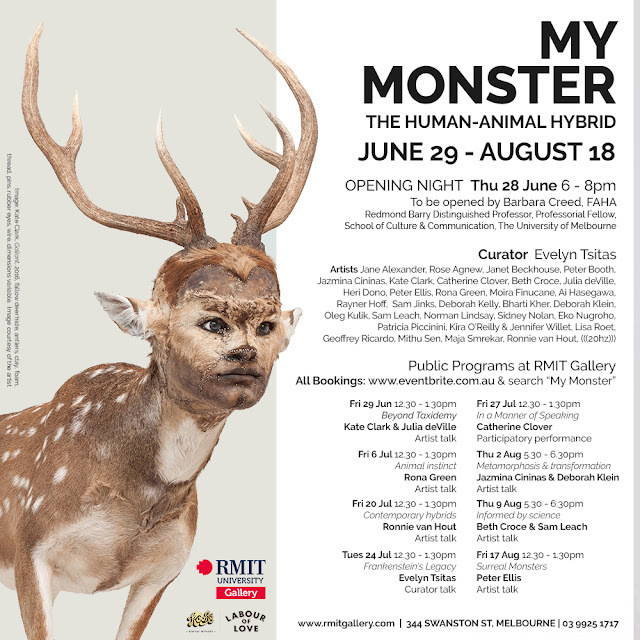 My Monster runs from 29 June - 18 August. 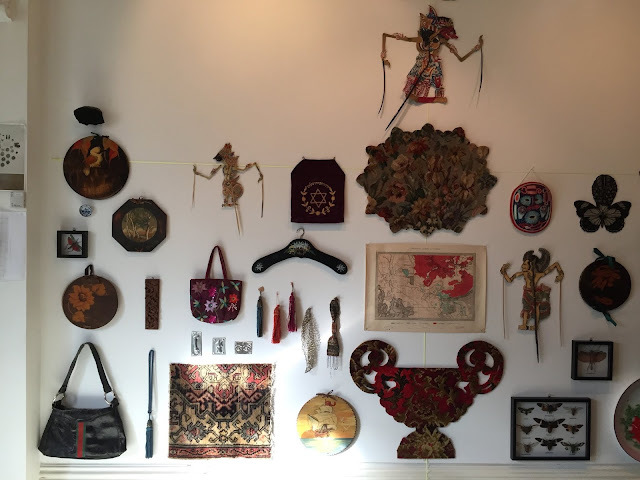 For further information, click HERE. 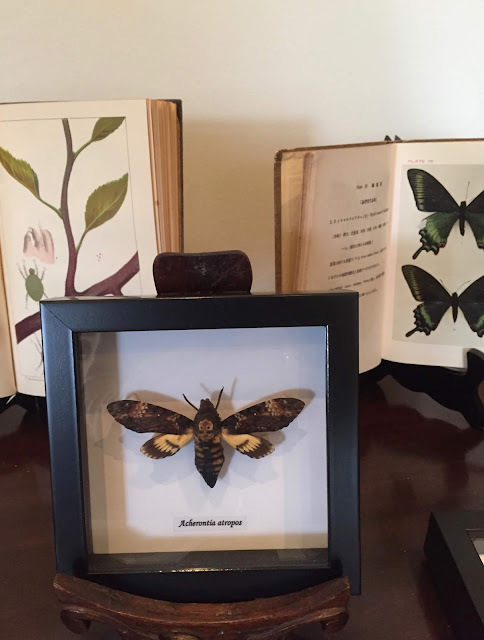 In celebration of the bicentenary year of Mary Shelley’s Frankenstein, the inmates of Homo-insecta: An unnatural history portfolio will shortly spread their wings in readiness for flight to Melbourne Athenaeum Library. The unbound artist book is part of the solo exhibition accompanying my residency at the library for Melbourne Rare Book Week. 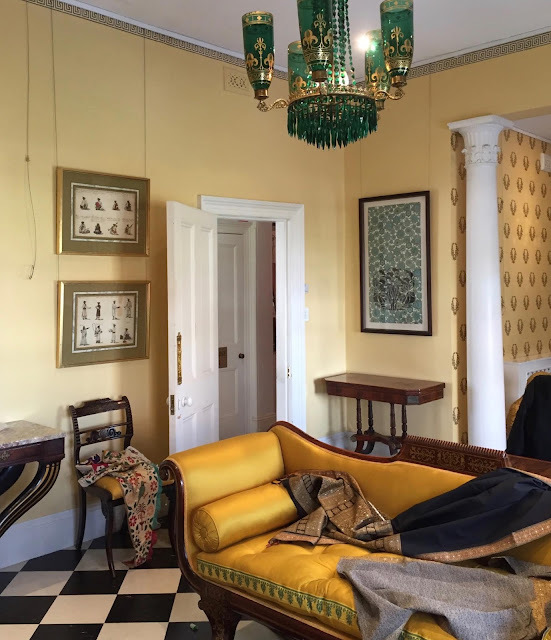 The residency runs from Saturday 30 June - Saturday 7 July. 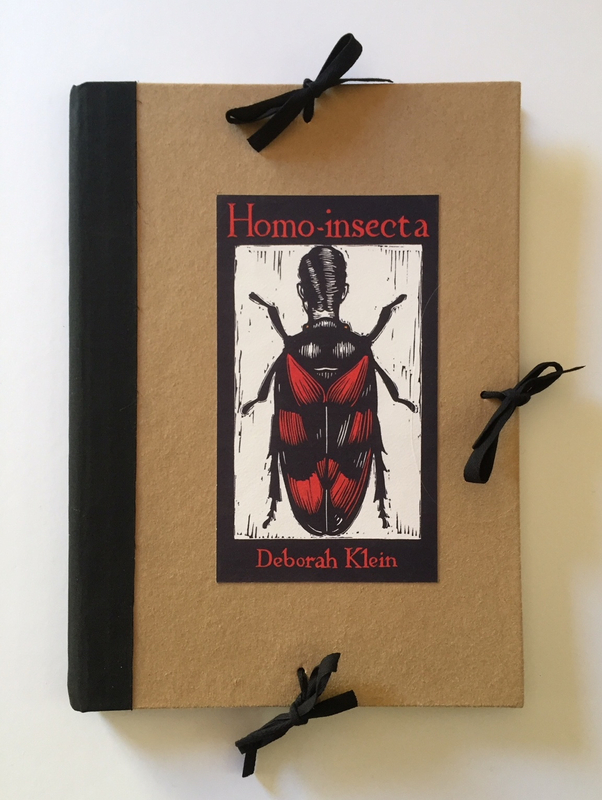 For information about related events and inside views of Homo-insecta: An unnatural history portfolio, visit Moth Woman Press HERE. 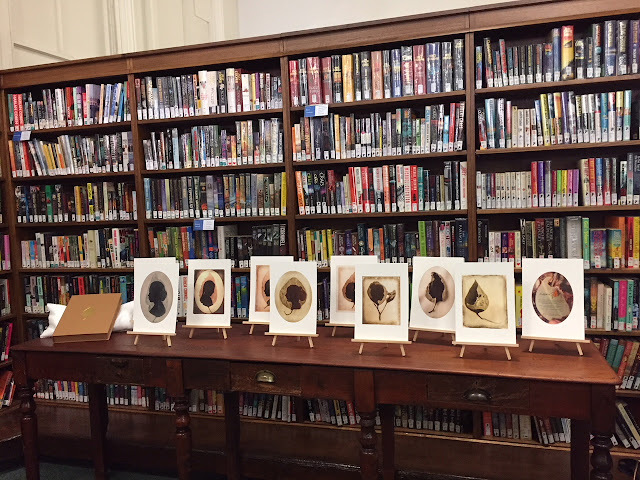 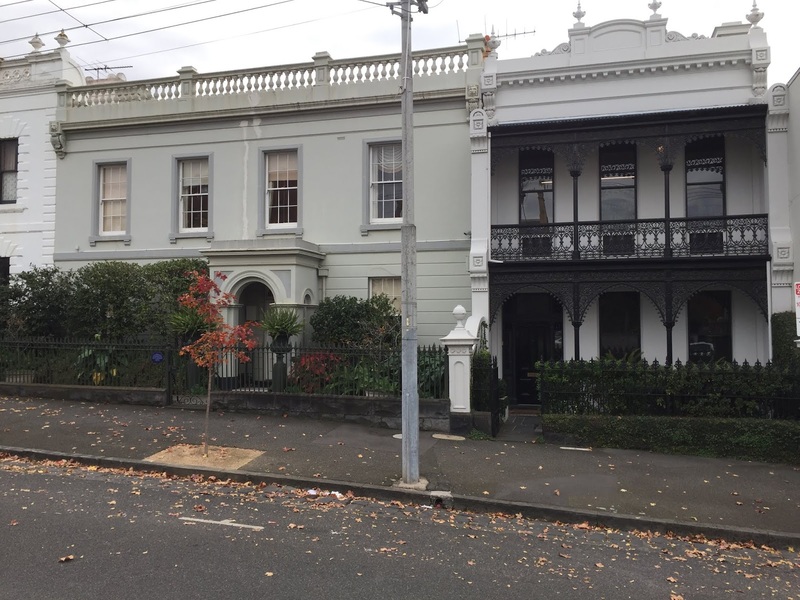 Melbourne Rare Book Week 2018 is nearly upon us, and for some weeks I’ve been gearing up for my stint as Artist-in-Residence at marvellous Melbourne Athenaeum Library. 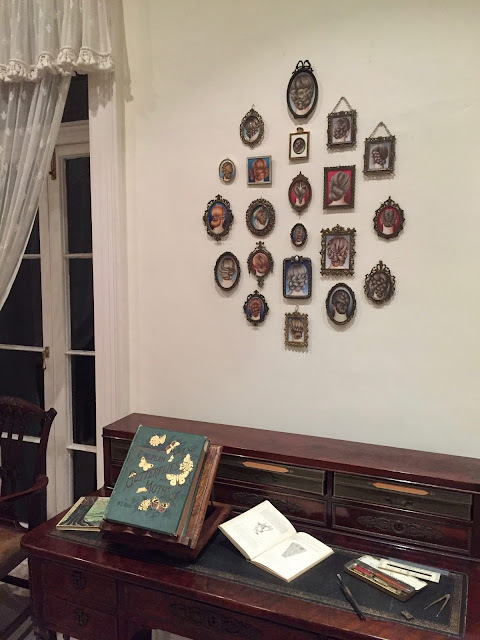 A selection of my artist books and zines will be on display during the residency and I’ll be working on a couple of projects focusing on women in gothic fiction, in particular, Mary Shelley’s Frankenstein and Emily Brontë’s Wuthering Heights. 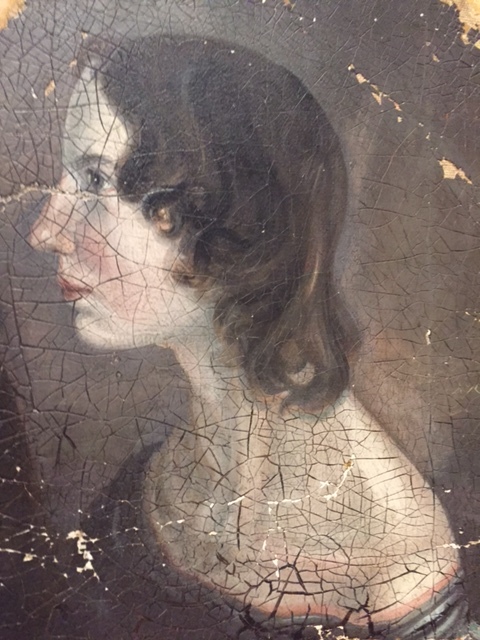 (Shelley’s novel and Brontë herself both celebrate bicentenaries in 2018). 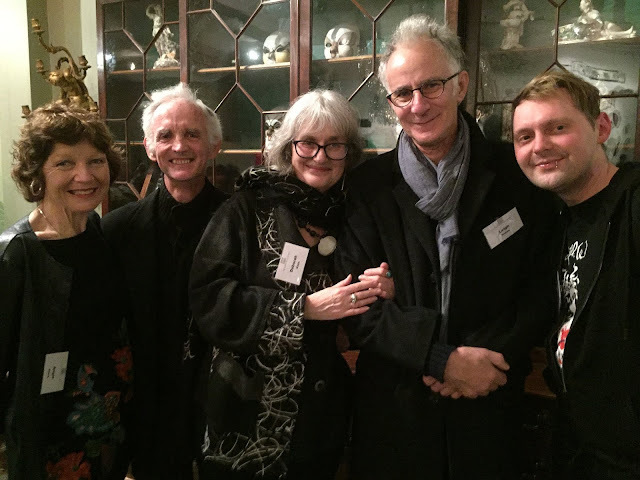 pictured during its launch at the library in December, 2017. 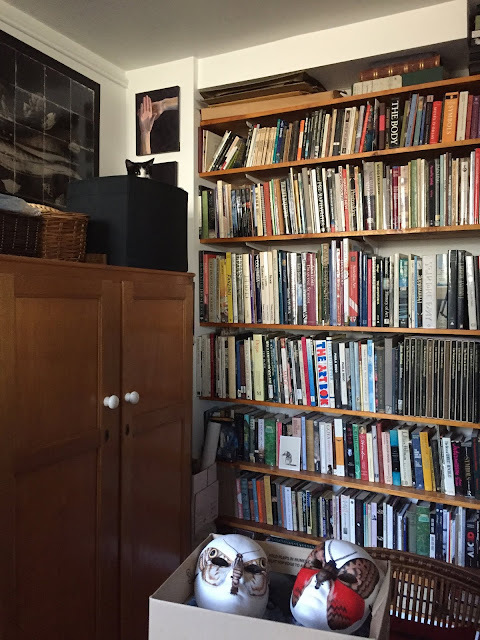 The book will also be exhibited during my residency. 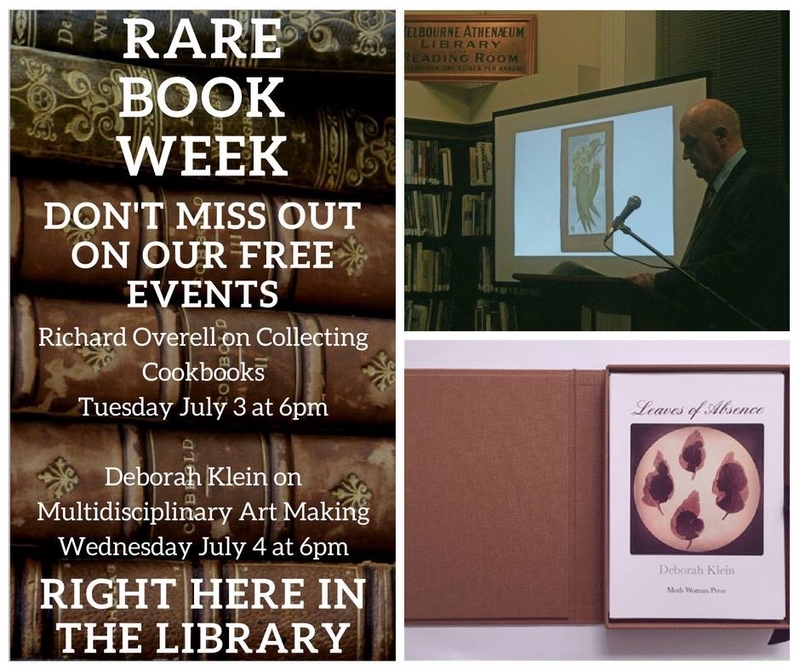 On Wednesday, July 4 at 6 pm I’m giving an informal talk on multi-disciplinary art-making, with a particular focus on book art and the importance of storytelling in my work. The event is free, but bookings are essential. 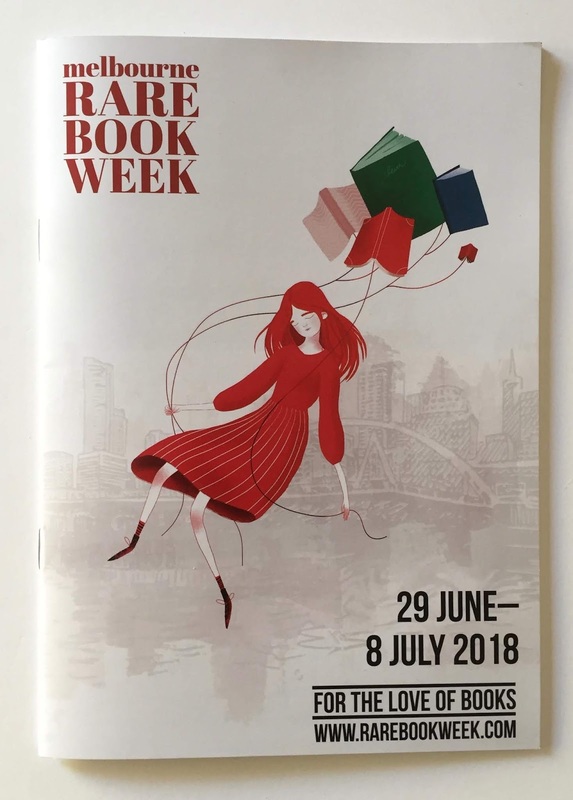 Melbourne Rare Book Week runs from 29 June - 8 July. For the full program, go HERE. 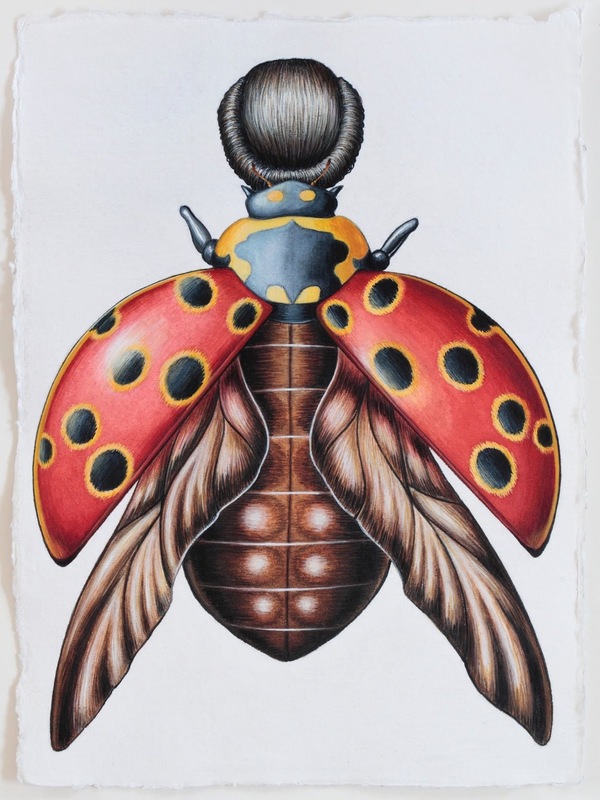 Three of my watercolours from the ongoing Homo-insecta series, including Ladybird Woman (pictured above) are part of this upcoming show. 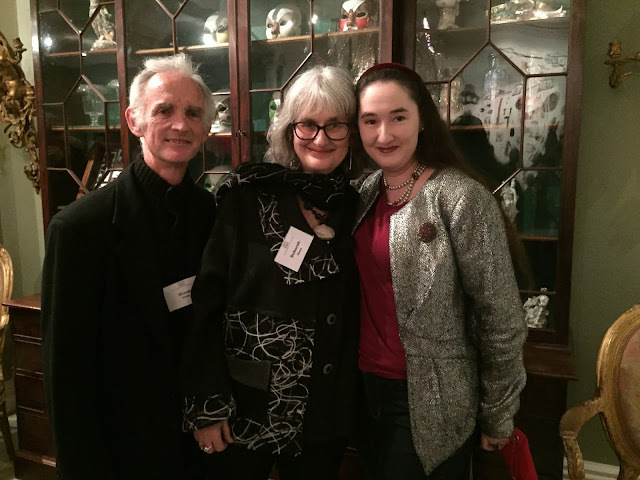 MY MONSTER: THE HUMAN-ANIMAL HYBRID explores our enduring fascination and revulsion with the merging of the human and animal, and coincides with the 200th anniversary year of the publication of Mary Shelley’s Frankenstein. The hybrid is the ultimate metaphor. 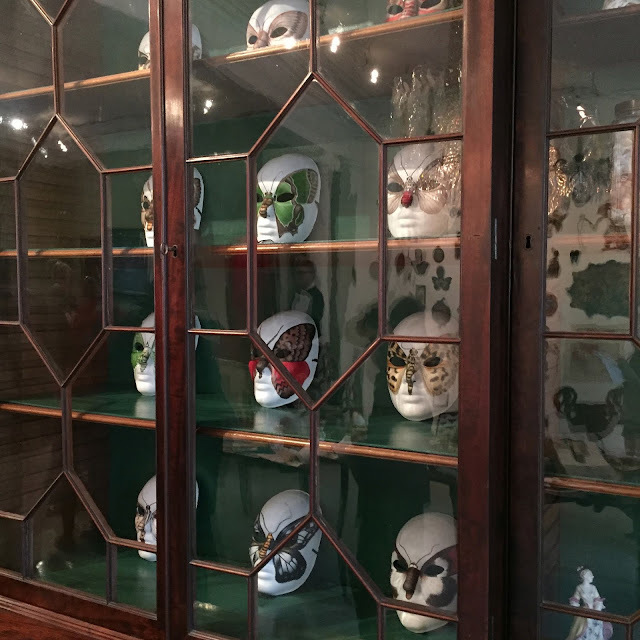 Its almost human image haunts us from horror films to mythology, fairy tales to folk lore, literature to all aspects of visual art. The trouble with hybrids is that they disturb our moral compass, reminding us that we are animals, and animals are like us. This is the power of the hybrid creature. 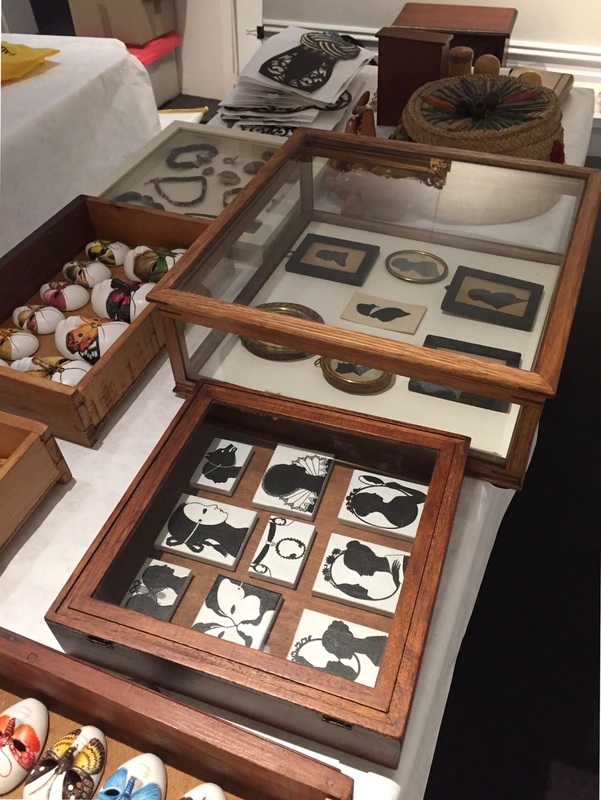 When we look into its human eyes, we see ourselves looking back from the animal body we deny we inhabit. Bringing together work by more than 25 Australian and international artists in diverse media from public and private collections, including several new works created for the exhibition, My Monster: The Human Animal Hybrid is curated by Evelyn Tsitas, based on her widely published doctoral research in this field. 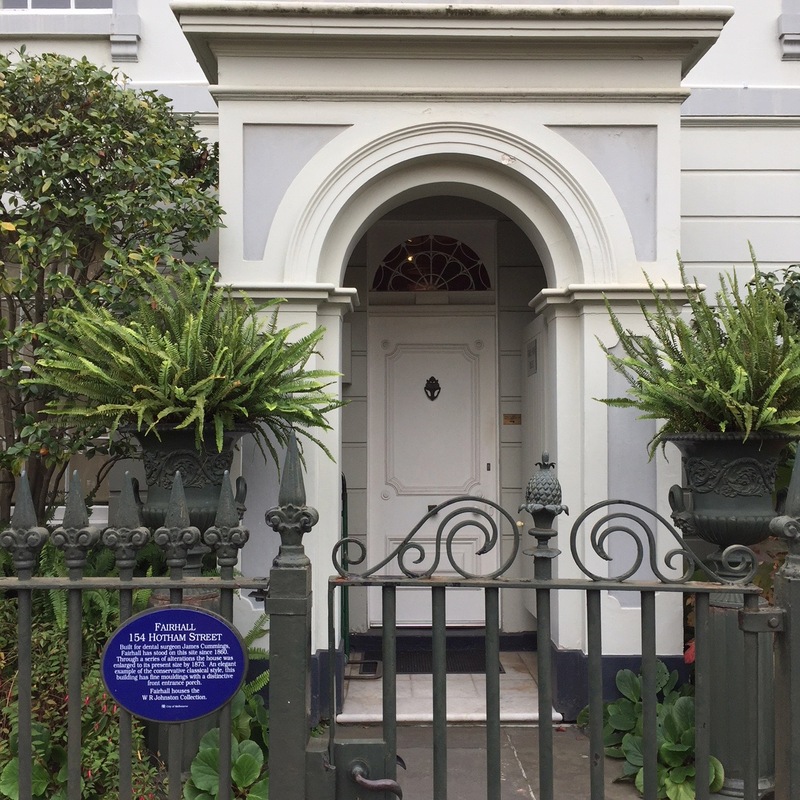 Opening speaker: Barbara Creed, Redmond Barry Distinguished Professor at the University of Melbourne and Honorary Professorial Fellow. Creed is the author of five books on feminism, sexuality, film and media including the feminist classic, The Monstrous-Feminine: Film, Feminism, Psychoanalysis (Routledge). Her recent research is on animal studies, the inhuman and social justice issues; and her latest publication Stray: Human–Animal Ethics in the Anthropocene (2017) explores the relationship between human and animal in the context of the stray. A number of Public Programs are scheduled throughout the exhibition's run. 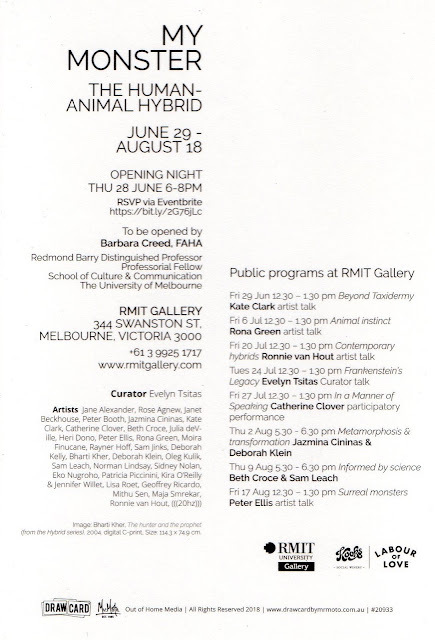 On Thursday, 2 August, from 5.30 - 6.30 pm, Jazmina Cininas and I will be speaking of Metamorphosis & transformation. 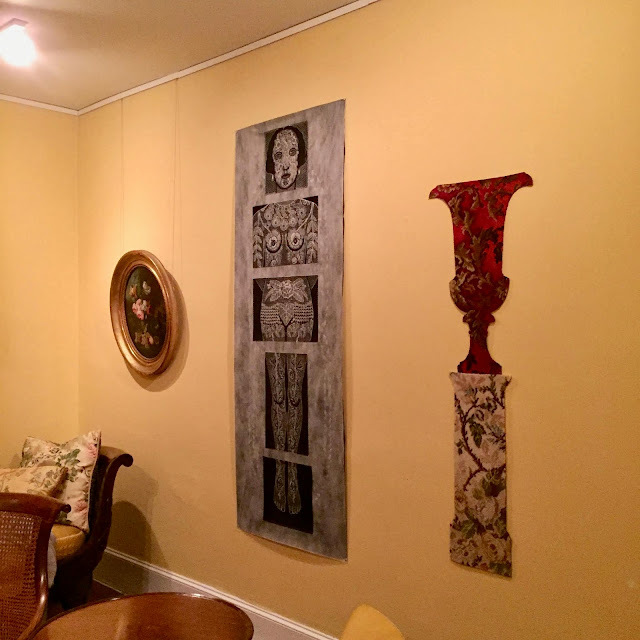 For a full list of artist talks, see the invitation above. Exhibiting artists include: Jane Alexander (South Africa), Peter Booth, Jazmina Cininas, Kate Clark (USA), Catherine Clover, Beth Croce, Julia deVille, Peter Ellis, Rona Green, Moira Finucane, Deborah Kelly, Bharti Kher (IND), Deborah Klein, Oleg Kulik (Ukraine / Russia), Sam Leach, Norman Lindsay, Sidney Nolan, Kira O’Reilly & Jennifer Willet (Ireland / Canada), Lisa Roet, Geoffrey Ricardo, Mithu Sen (IND), Maja Smrekar (Slovenia) and Ronnie Van Hout. 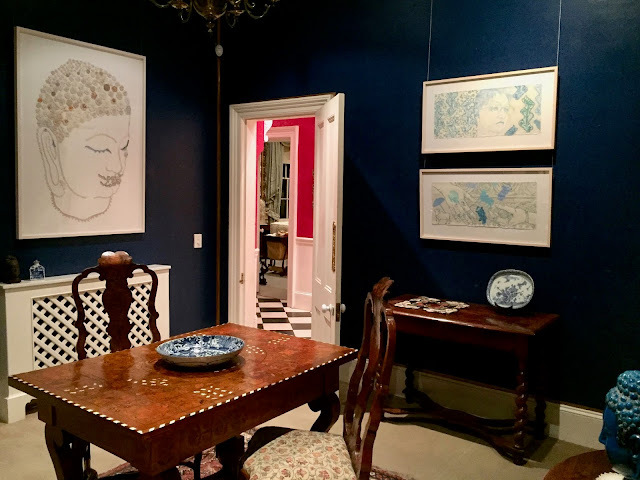 The exhibition runs until 18 August. First shown back in March in the exhibition Heads and Bodies at Charles Nodrum Gallery, Melbourne, The Secret Plait (2016-17, oil pastel and chinagraph pencil on Khadi rag paper, 76.5 x 56 cm), is one of fifty works shortlisted for the Paul Guest Prize 2018 at Bendigo Art Gallery. 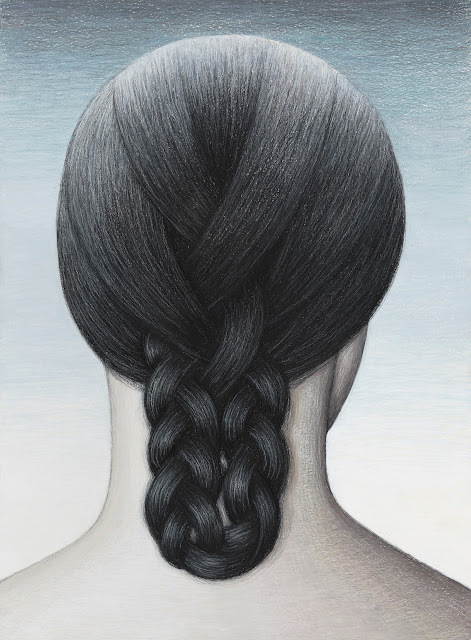 I discovered the diagram for this Secret Plait (and yes, that really is what it’s called - I’ve no idea why, but the name serves my work well) many years ago in an old book in my local library. 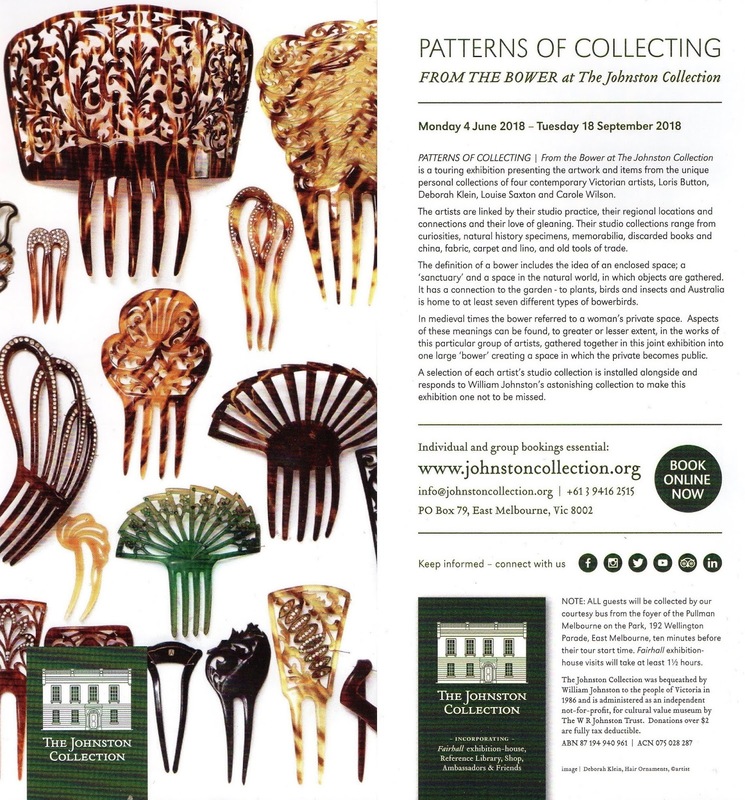 A hearty thank you to everyone who came to yesterday evening’s launch of PATTERNS OF COLLECTING/From the Bower at The Johnston Collection (we had a full capacity audience, with a waiting list). 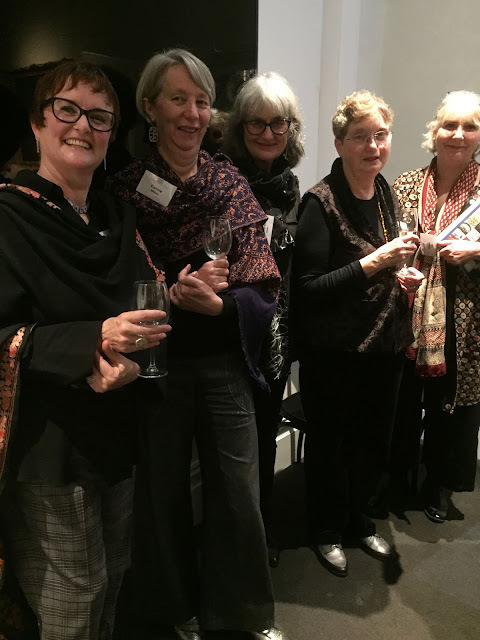 Thanks also to Alison Inglis for her fantastic opening address, to TJC Director/Curator Louis Le Vaillant and the peerless volunteer guides, it was an evening to remember. 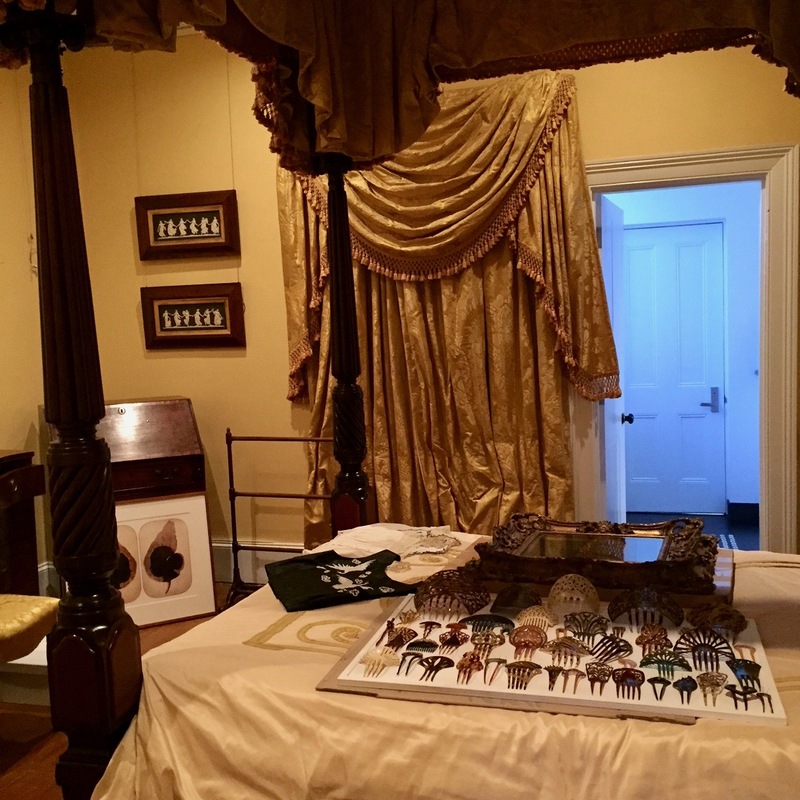 My Monster is an exhibition that celebrates the 200th anniversary year of Mary Shelley’s novel Frankenstein and the enduring fascination with the human animal hybrid. 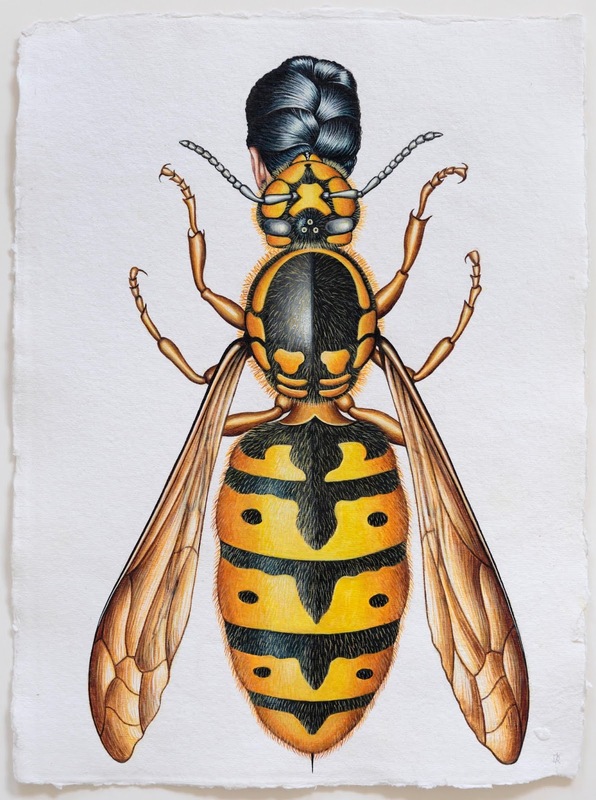 Curator Evelyn Tsitas has selected three of my works for the show, including European Wasp Woman. 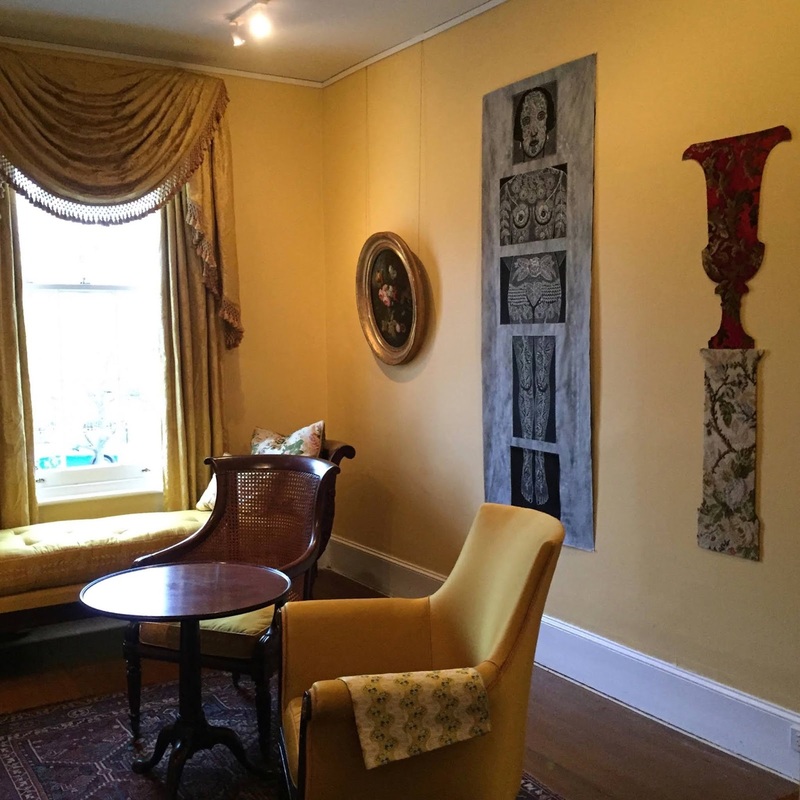 Exhibiting artists include Jane Alexander (South Africa), Rose Agnew, Janet Beckhouse, Peter Booth, Jazmina Cininas, Kate Clark (USA), Catherine Clover, Beth Croce, Julia deVille, Heri Dono (ID), Peter Ellis, Rona Green, Moira Finucane, Rayner Hoff, Ronnie van Hout, Sam Jinks, Deborah Kelly, Bharti Kher (IND), Deborah Klein, Oleg Kulik (Ukraine / Russia), Sam Leach, Norman Lindsay, Sidney Nolan, Eko Nugroho (ID), Patricia Piccinini, Kira O’Reilly & Jennifer Willet (Ireland / Canada), Lisa Roet, Geoffrey Ricardo, Mithu Sen (IND) and Maja Smrekar (Slovenia). Selected installation views of PATTERNS OF COLLECTING/From the Bower at The Johnston Collection, snapped on Monday evening just before guests arrived for the Friends of the Johnston Collection Preview (which we enjoyed very much) and shortly after it ended. 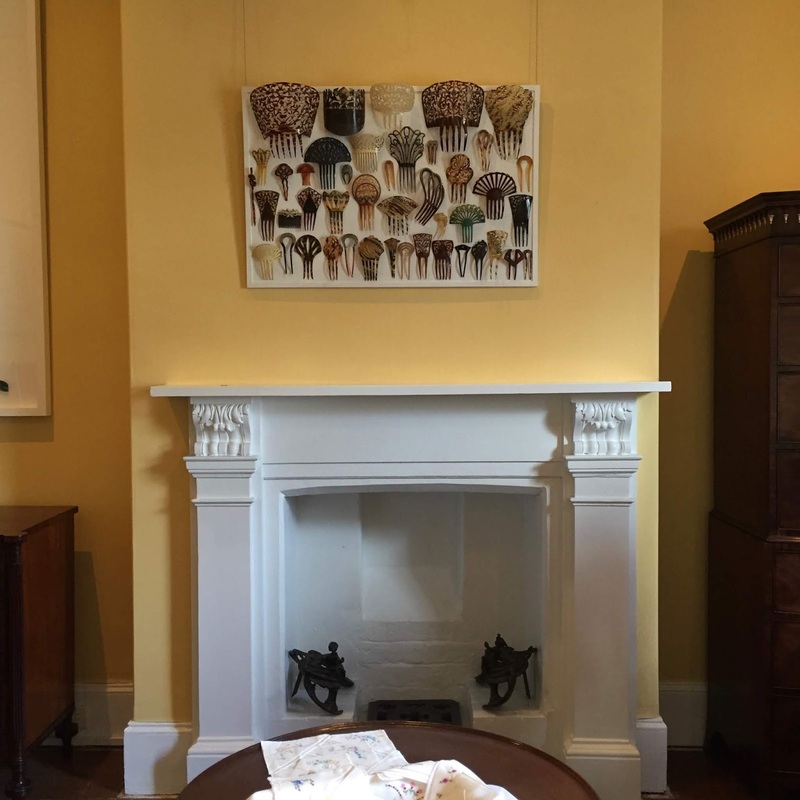 Featured are collection items and artworks from and by myself, Carole Wilson, Loris Button and Louise Saxton. 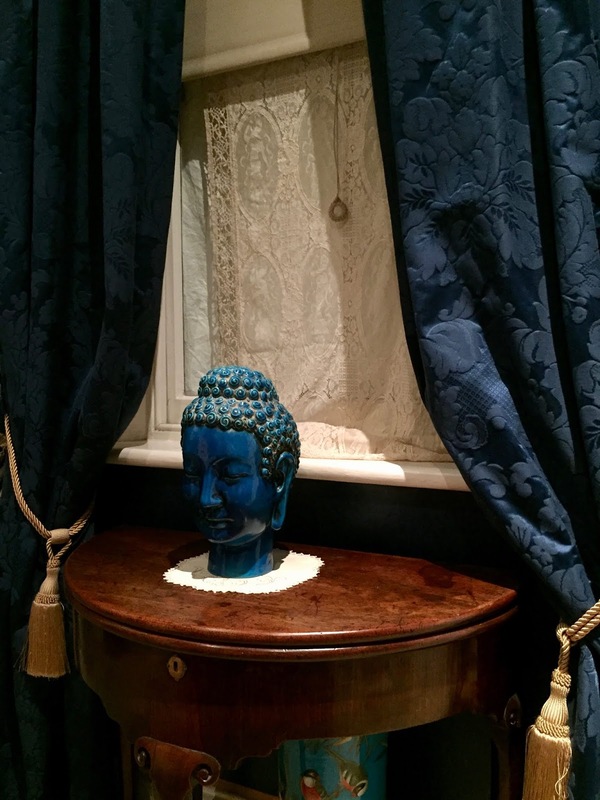 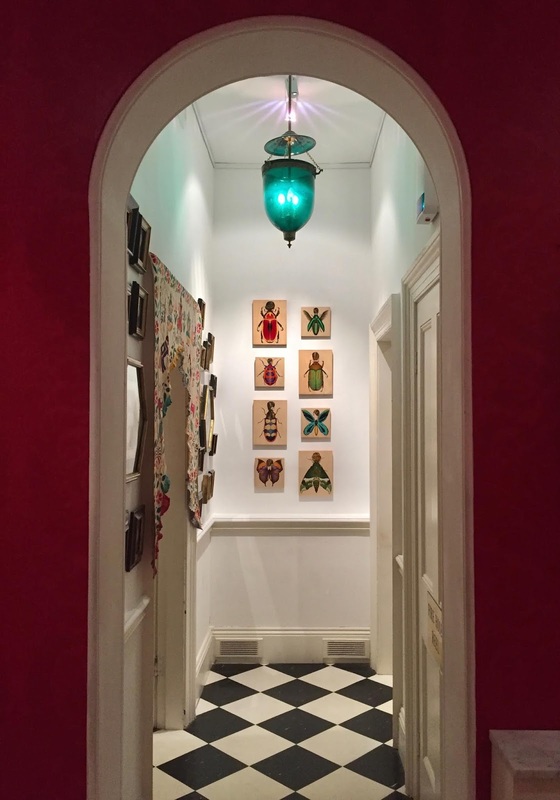 The most recent addition to the show is the ceramic Buddha, inherited many years ago from my Aunt Eileen and now installed in the Chinoiseries Room opposite Louise Saxton’s superb Buddha, painstakingly constructed from reclaimed needlework. FROM THE BOWER/Patterns of Collecting at The Johnston Collection opens today. 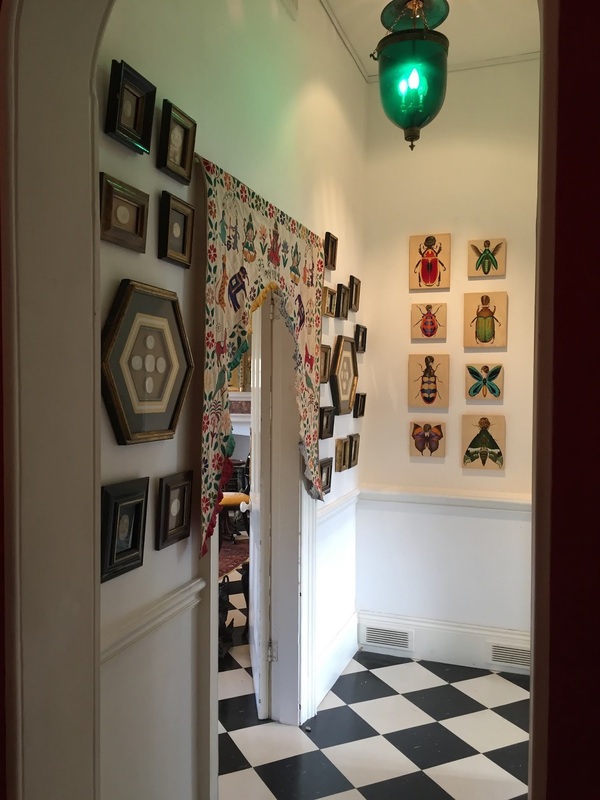 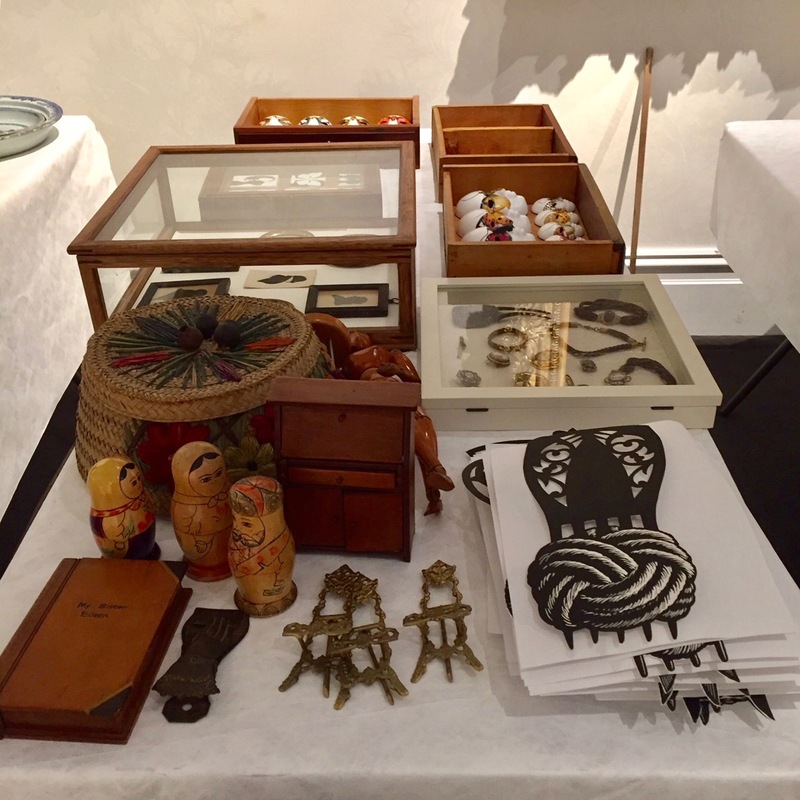 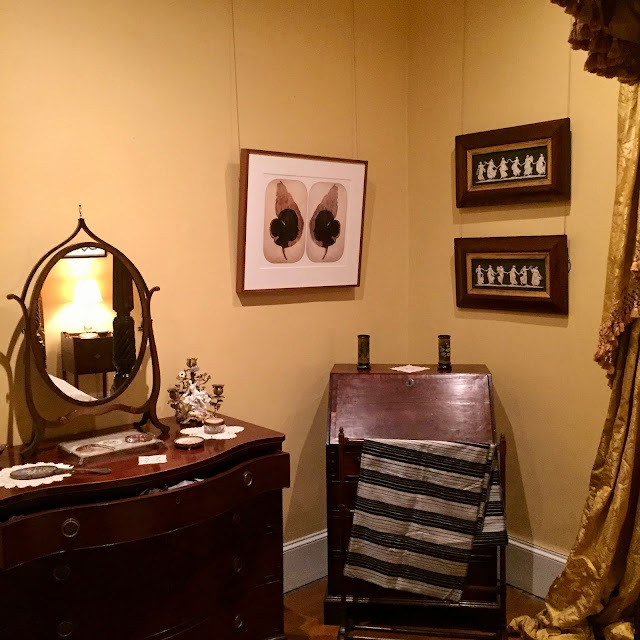 In a series of specifically themed rooms, artworks and items from the bowers of myself and fellow artists Louise Saxton, Loris Button, Carole Wilson sit alongside corresponding artworks and items from the museum’s permanent collection. Join PATTERNS OF COLLECTING guest artists for a Walk and Talk as we discuss our work and the inspiration and processes behind the exhibition. The exhibition runs until Tuesday, 18 September. 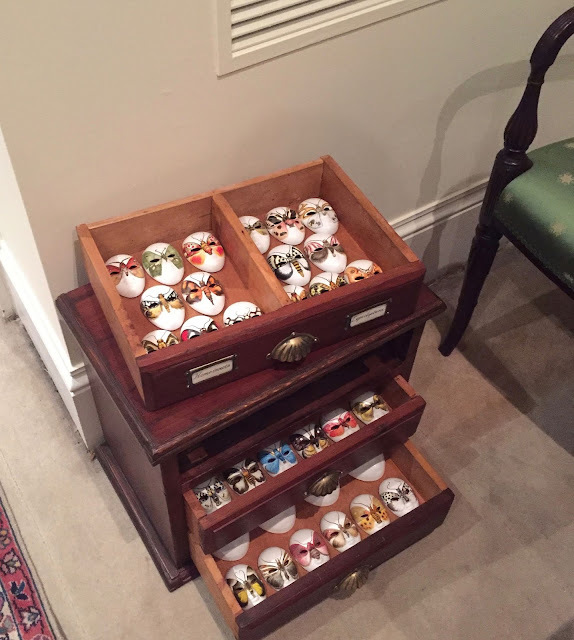 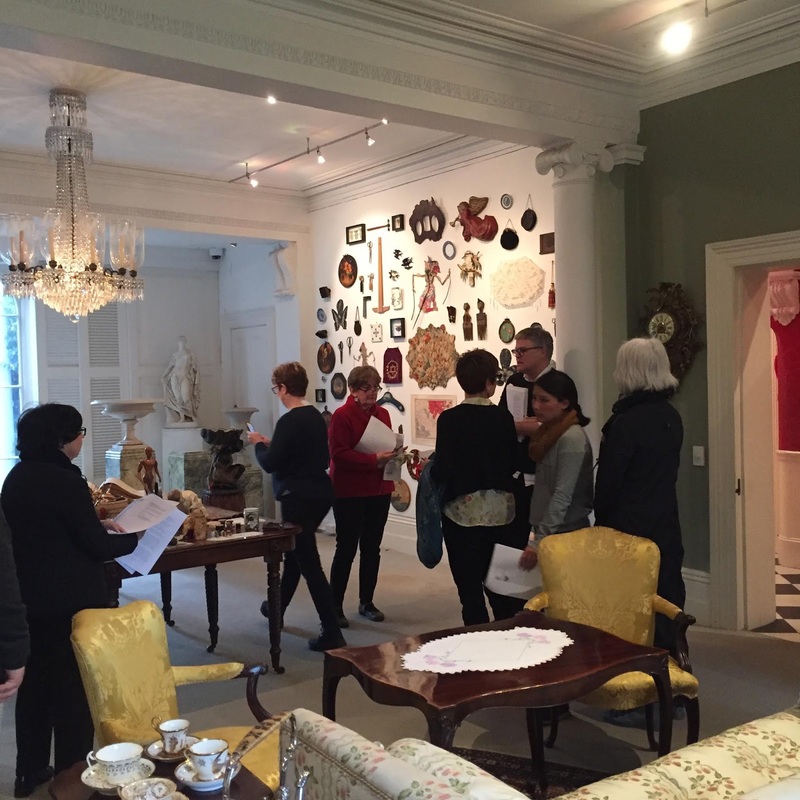 As noted in my earlier post, PATTERNS OF COLLECTING/From the Bower at The Johnston Collection, opened to the public today. 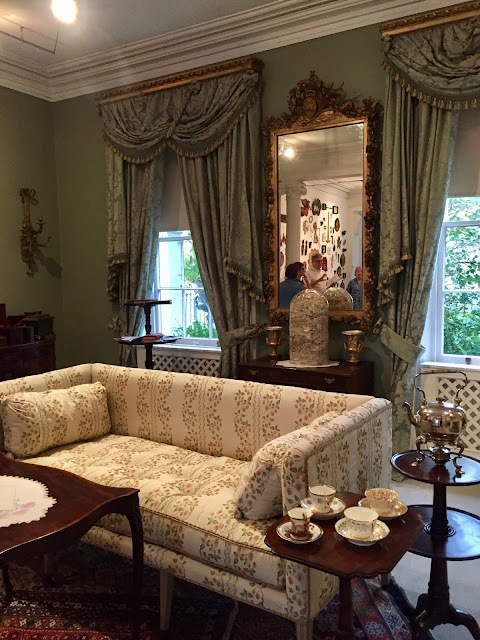 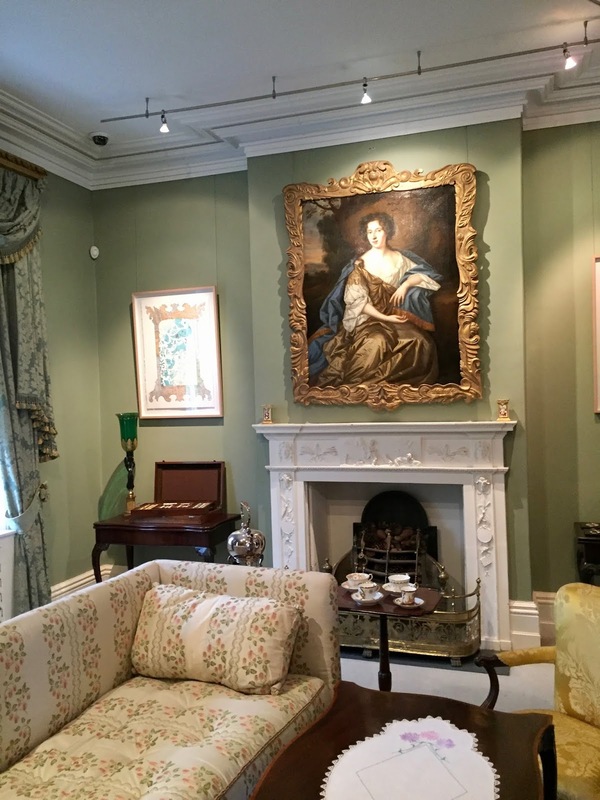 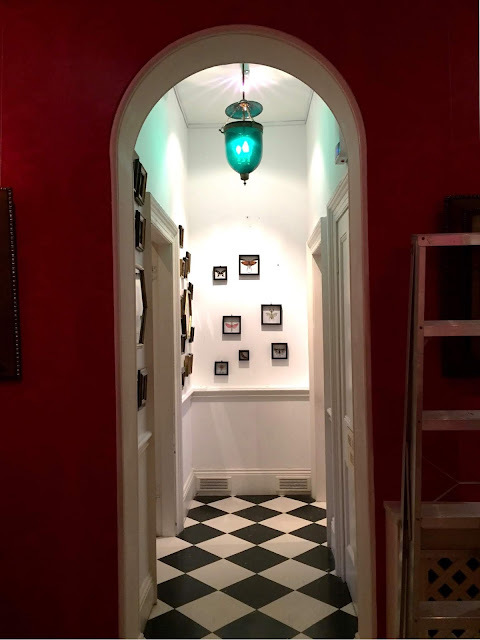 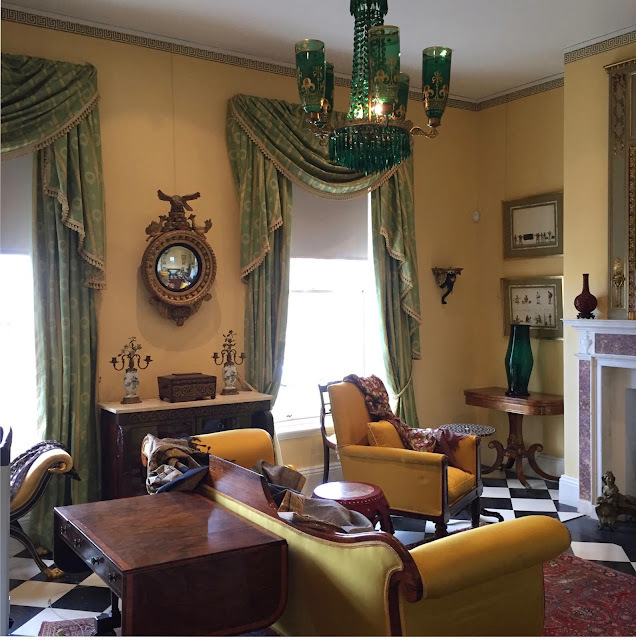 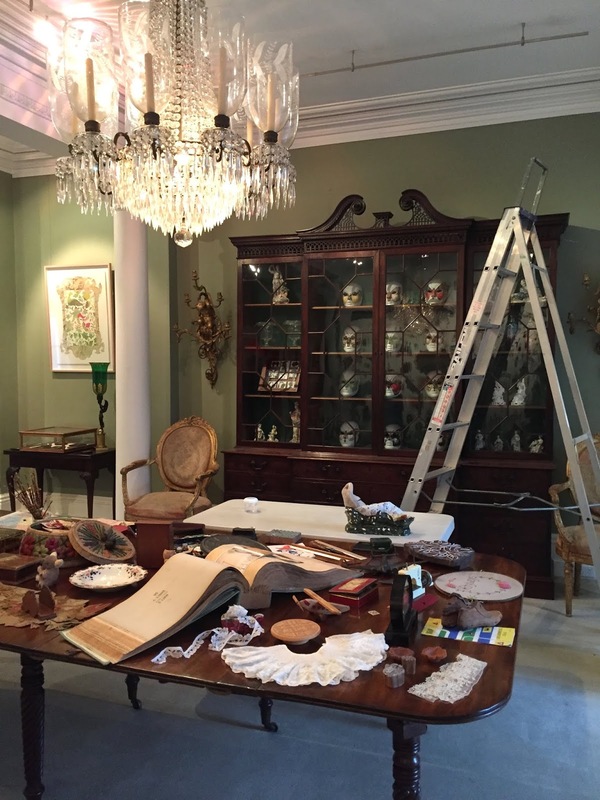 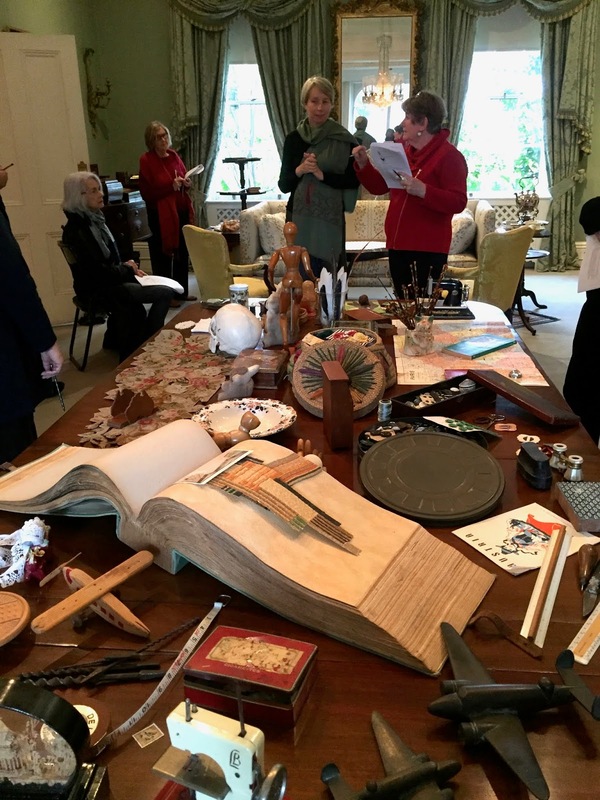 Hours before this evening's preview event for the Friends of the Johnston Collection, I look back on the week that was, wherein the show was installed over a period of 5 days. Sunday, 27 May (Day 1): At our Abbotsford place as Alice watches on high, my packing is finally completed. 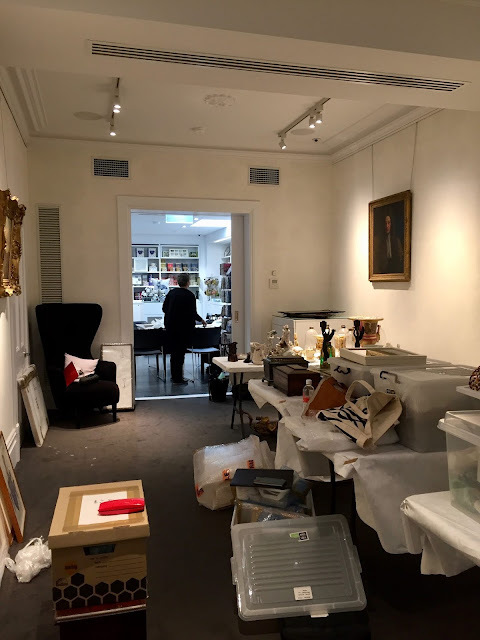 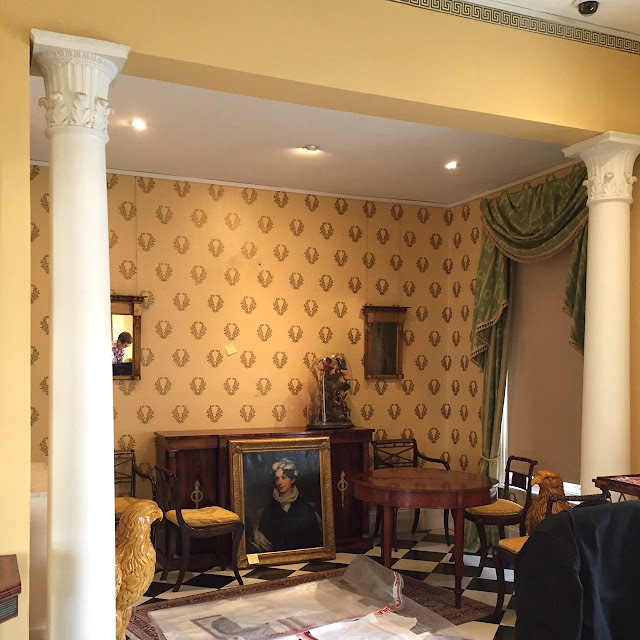 After a late morning drop-off to the Johnston Collection, the placing of our artwork and collection objects within the Johnston Collection is still in the early stages, but progression has definitely been made. 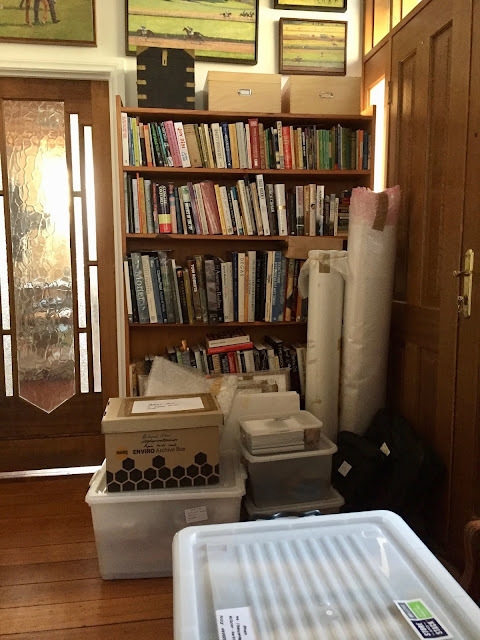 Monday, 28 May (Day 2): Seemingly endless unpacking and placement continues. By day’s end we’re all exhausted but feeling less overwhelmed as our collective vision starts to take form. 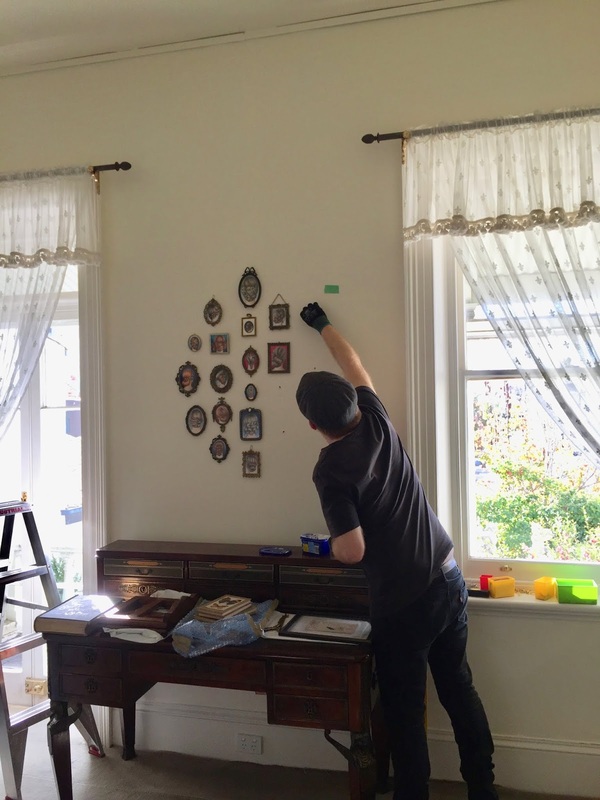 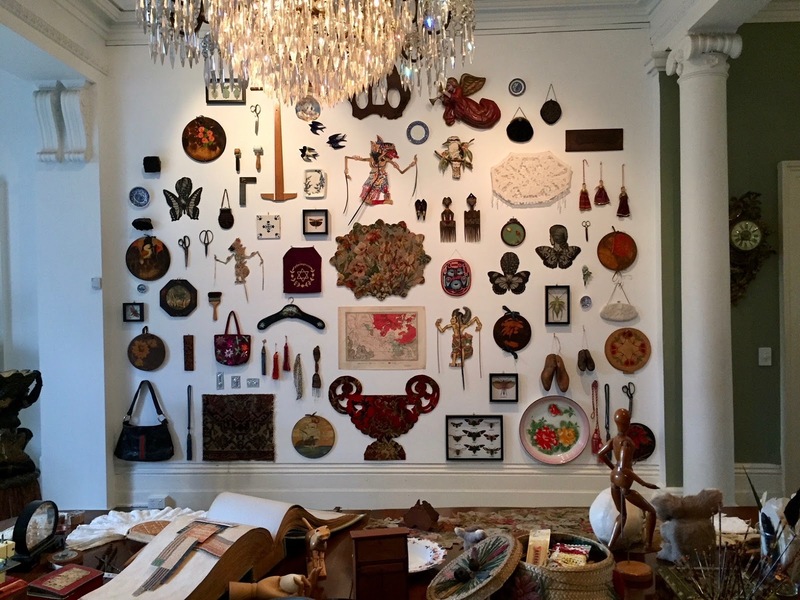 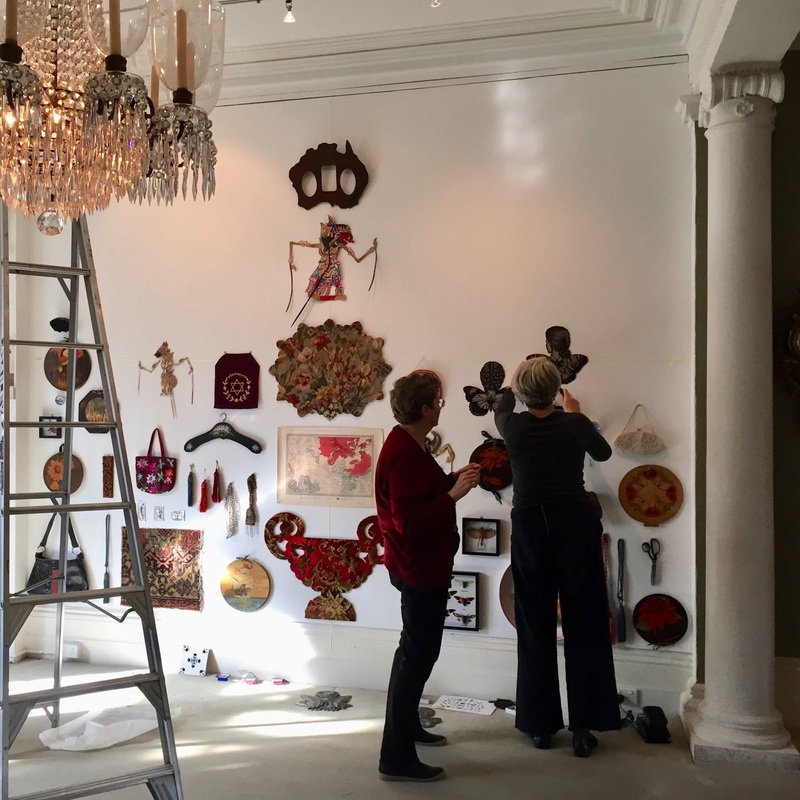 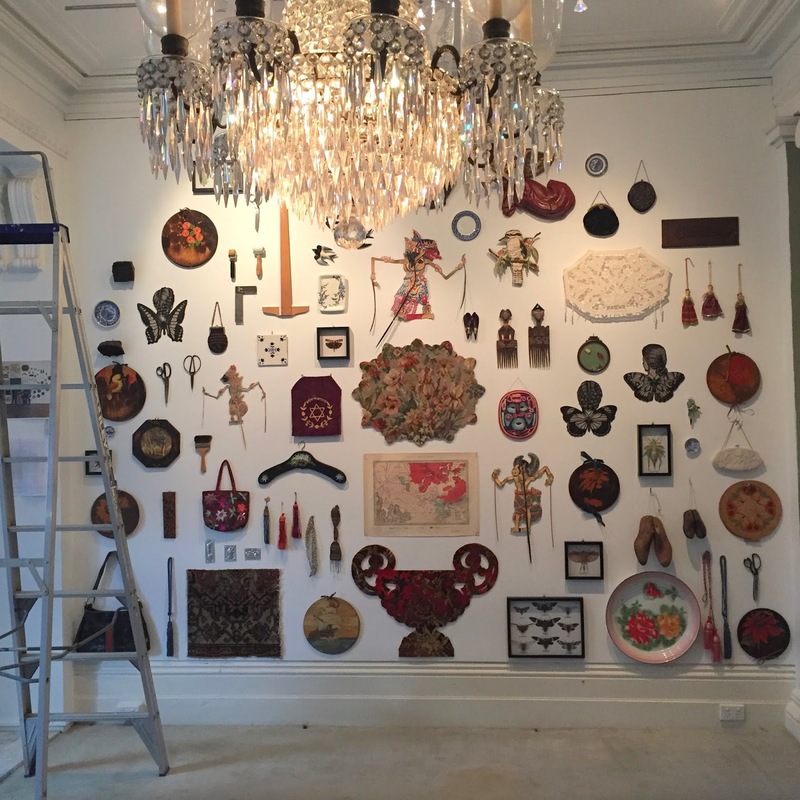 Tuesday, 29 May (Day 3): Gradual but definite progress is made, including the painstaking installation of the combined collections wall by Loris Button and Carole Wilson. Wednesday, 30 May (Day 4): By day’s end, we’re just about done, and a collective sigh of relief is heaved. 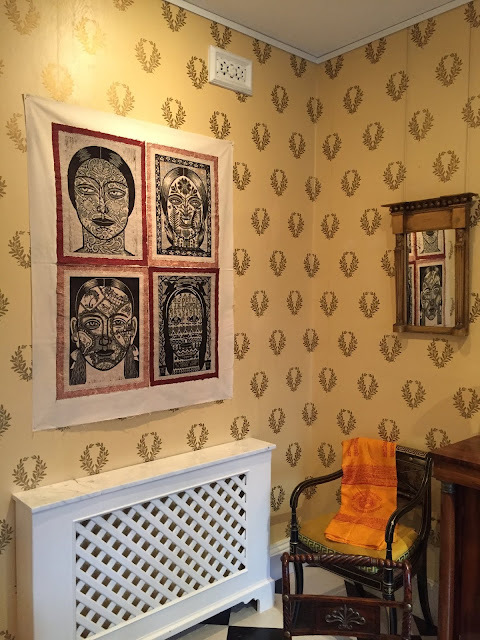 Tattooed Faces Sampler (1997), a seasoned veteran of our show’s tour, now hangs in the magnificent Passage to India Room. 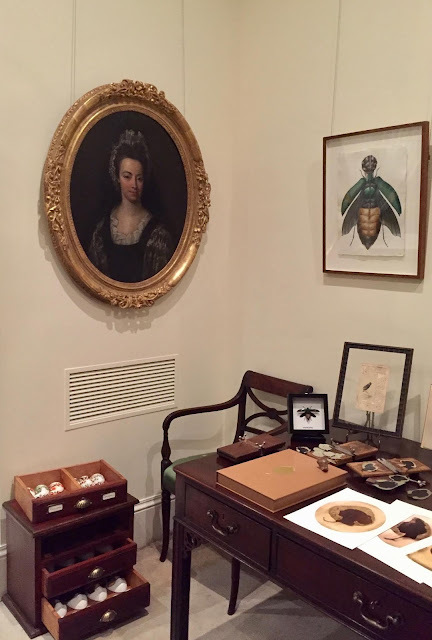 In the hall, a swarm of insect women hover outside the entrance to the Natural History Room directly opposite. 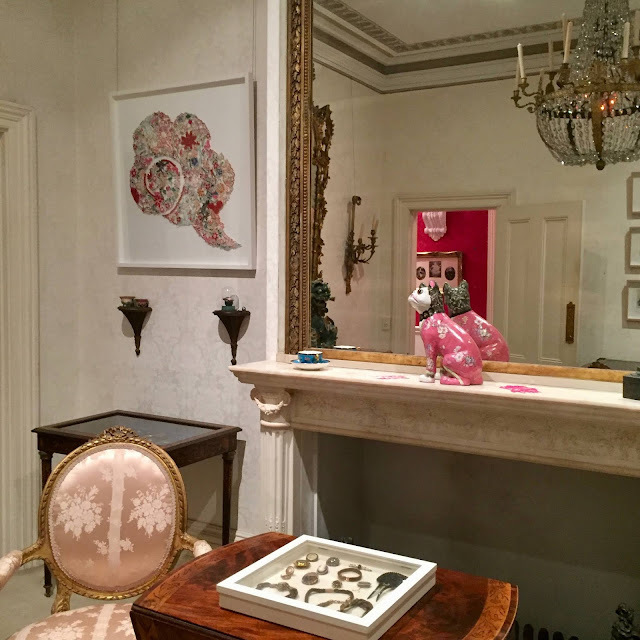 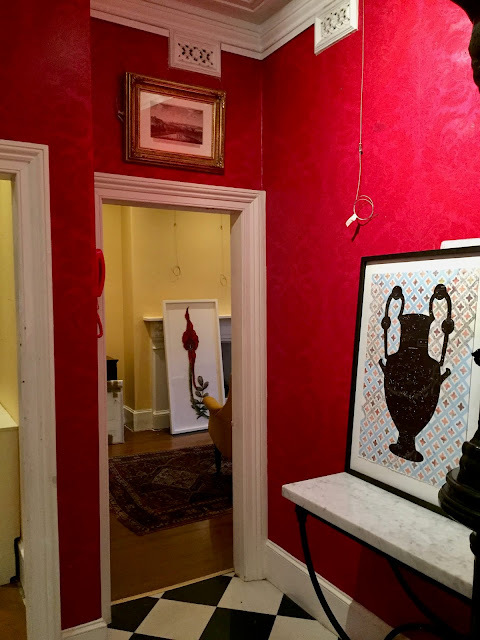 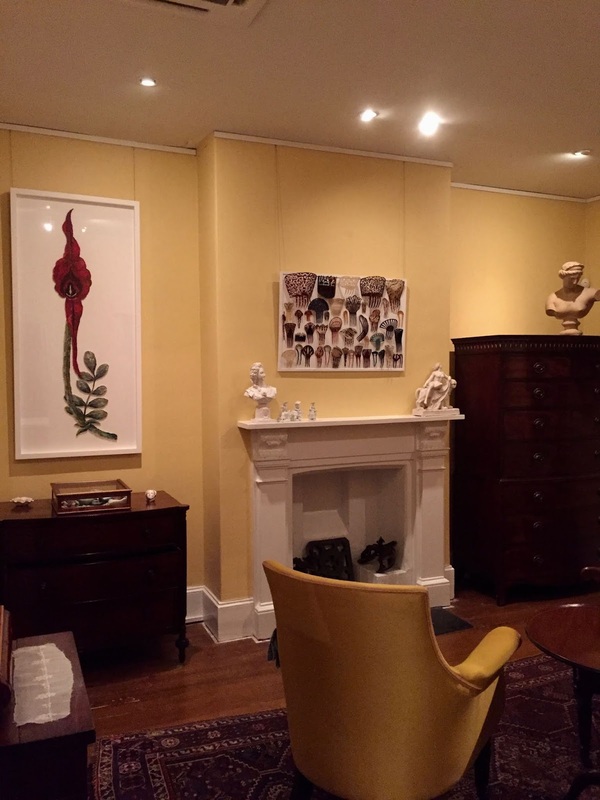 Further down the hallway, through the Boudoir and into the adjoining Sitting Room, a life- sized linocut on fabric, Daughter of Time (1997) hangs alongside artwork by Carole Wilson, one of several of her works that directly reference the house and its collection. 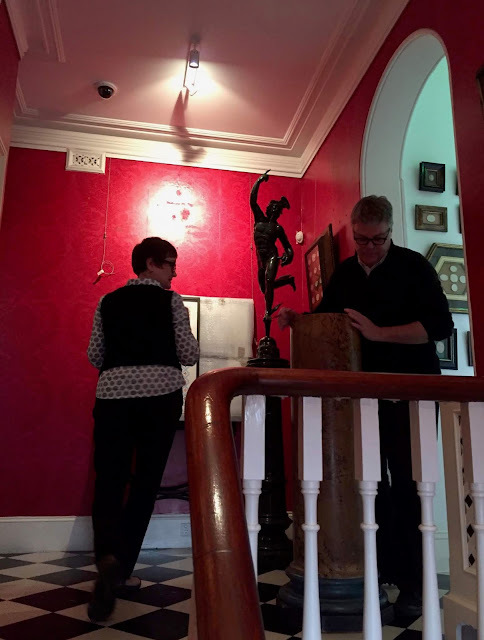 Down the staircase and into the Wunderkammer Room, where a glorious lace-filled dome by Louise Saxton is reflected in the mirror, as is the artist herself, along with museum director Louis Le Vaillant and Robbie and Dorothy, just two of the museum’s tireless workers who have played an enormous part in the installation of our show. 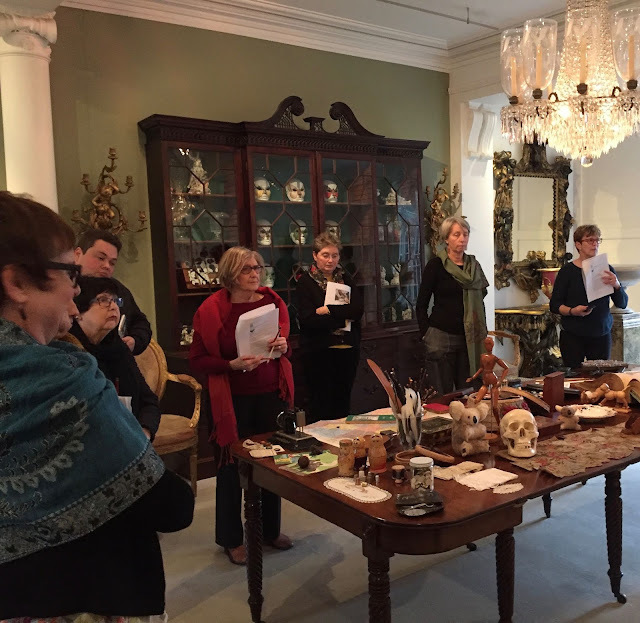 Thursday, 31 May (Day 5): In the Wunderkammer Room under the benevolent gaze of Baroque-era portrait painter Mary Beale, Louise, Loris, Carole and I begin the first of two walk-through sessions with the museum guides.